We hope this message finds you well here in the holiday season! It's hard to believe, but it has been one full year since we started production on Snakehead. As we reflect on the year that has passed, we have so much to be thankful for. First, we cannot overstate how appreciative and thankful we are for you all. Not just for your support of our campaigns, but also for your patience. Making Snakehead has taken longer than we expected. Typically, an independent film takes between 18-21 days. For Snakehead, we had 40 days of production spread out over 7 months. It took us that long because we had a small budget but an ambitious story that required a logistical dance that even films with 10X the budget might raise an eyebrow at. We had to juggle actors' schedules, deal with crew availability, find impossible set pieces, make locations appear out of thin air, move hundreds of gallons of water, feed hundreds of extras on several occasions, persevere in the face of a huge snowstorm, lugging gear from city to city and coast to coast, making many returns at Home Depot, while always trying to focus on delivering creatively. As one could imagine, with such a complex production and limited resources, the post-production has proven to be equally as challenging. We have been very deliberate and careful in the editing process to get things right. After putting so much time into development (nearly 10 years!) and physical production, we simply can't rush delivering this film to the world. So, while we would love to have been accepted into Sundance this year, or to even know when we will be good and ready to be publicly exhibited, we're going to continue to grind it out and not just finish it for the sake of finishing it. With every day that it marinates, with every critical eye who has seen it, and with every pass we make at the edit, the film is getting there. It's incredible how tedious editing can be and how the seemingly smallest choices can make the biggest impact on a story, but that's where we are right now. The film has not been ready and we just don't want to make our debut until we know we've done all we could and put our best foot forward. Once again, we thank you for your unconditional support and unwavering faith. It means the world to our team and we promise that when we see you again, we will have done all we could to make you proud. First 2 minutes of the documentary in the making snakehead saga by davey chin. SNAKEHEAD IS IN THE CAN!!! How are you all? Hope all is well. It's been quite a journey since we last spoke and I appreciate your patience with these updates! So, after 6 months, 5 cities, dozens of miracles, a shipping freighter, two Chinese banquets, a big rig, numerous dim sum days, South Florida, a massage parlor, San Francisco, sponge cakes, aquariums, lobsters, cold pools of water, more water, AMAZING PERFORMANCES, and a crew and family that went to war for me, WE have a movie in the CAN! It's been an experience that I will remember for the rest of my life and I am excited to share with you all more behind the scenes content as we work through this next phase of post-production. Now that we have time to breathe, we are going through the Kickstarter rewards. So, look out for an email/mail/shoutout soon! For now though, I'll share this one story about a boat in Florida. If you didn't realize this already, Snakehead had some big set pieces. For most indie films, you get 2, maybe 3 of these scenes. Set pieces are usually complex action-oriented scenes that take more than just two actors talking out a scene. Snakehead had about 22 set pieces. When I first started writing, one of my mentors said write huge and then you can cut for budget. So, I wrote big anticipating the cuts. ENTER BRIAN YANG, indie movie producer. Brian and I had differing expectations. He was not going to let ridiculous conventional thought stop him. His plan was to get me everything in the script in our budget which was basically next to nothing. And now, 6 months later, he actually did. One of the most significant reasons why this movie took so long was because we built the schedule off of situations, locations, and logistics to meet our budgets-which basically meant as little as possible. If we were a big hollywood movie, we would just throw money at all these problems and they could work around our schedules. Alas, we didn't have money but we had a lot of set pieces. I knew the shipping freighter scene in the script was going to be problematic from a producing stand point, but during production we had so many other problems that I didn't press the issue. So, when we were actually faced with shooting this, Brian didn't even ask me to change the script. For over 6 months, Brian called everywhere in the world while producing the rest of this crazy movie. He then did something logical and creative. Brian took a map and called every coastal state in America. From Washington to Louisiana to Maine, he called every port, film commission, and private shipping company that he could google. In our extensive research for a boat, (we know more about shipping freighters than anyone should ever know) we discovered the hardest obstacle was the boat itself. No one would allow us to shoot on their boat for nothing. The costs, the risks, the insurance, were just too great for our little movie. It looked like I had to either change the story or cheat it tremendously. Out of nowhere, a shipping company based out of West Palm Beach, Florida responded to of all things, a bulletin board post! KEVIN, owner of a small family owned shipping company that ships between Florida and Haiti, saw what we needed, emailed us the 2 boats he had and told us to come on down. Now, this seemed to be good to be true. A free shipping freighter for 2 days was something that we never got close to getting anywhere in the world. After several hours of phone logistics with Kevin, the port of Palm Beach, and the film commission, we decided to take a chance down there and test our karma. Skeptical, but in hopeful spirits, we discovered this was all true. We got a 300 foot boat near free because of our passion and the good will of mankind! Now, I just had to make a good scene!! Moral of the story, Brian is incredible, Kevin is incredible, and Thank God for google maps! The next problem was: how do we get 100 Chinese extras in Florida? The actual shoot went incredible. It didn't come easy, but that's a story for another post. They say you write a movie three times- Once when you write it on the page, second when you shoot it, and third when you edit it. We have graduated to the 3rd process. I've teamed up with Master Editor, Greg Louie, who I've been collaborating with since the Last Trumpet to BLT Genesis to Linsanity. So, we got this. Editorial is quite different than shooting but it still has its own set of challenges. The days are long and dark but they aren't any easier when time is short and money is non-existent. But we will prevail through this process just like we did with production, because we must. Stay tuned for more updates, more footage, and being my first fans, you get the honor of spreading the word first about this movie. We need all the help we can for this project. The internet should make this a little easier, but there is nothing more powerful than word of mouth and community support. You're all a part of the Snakehead team. I think I do this in every update, but I can't Thank You for believing in me and this project. The crew heard all the support, buzz, and cheers from of all you the past 6 months and that momentum has carried us. Its truly amazing what can be done when the passion spreads to the community. Thank you for your patience it's been a while since we last corresponded. As always it's been a busy time for me. We wrapped about 90% of production and it's been one of the most incredible experiences of my life. We (almost) made a movie!!!! I can’t thank you enough for supporting and believing in me and this movie. You are all very much a part of this. So, I know we owe a lot of you some rewards. As soon as we wrap fully with production, in a few weeks, we'll take care of all of you! I promise, be ready for it! In terms of actual production, this was the most brutal shoot of my life (as it should be). Armed with my badass cast and crew, we just shot a low budget movie in the coldest month of the year in New York City! Almost all of us got sick and uncomfortable all of the time. We fought/pushed through the freeze, the wet, and unbearable situations. We had some lows and we had some miracles. When the whole production could’ve fell apart, we managed. When things got hard, the crew got harder. We got mad stories to tell! But what matters most is that we prevailed and we created. This journey has been everything that I would have hoped for and more. I never knew what it would feel like to get this far but I'm confident to say we made a great movie and I can't wait to share with you. While we are feeling good, we still got the last 5 minutes of this game. 90% of shooting is done but this last 10% is what counts the most. For me this last 10% is what wins the game. I must, we must finish strong. We have a little more to go and I'm asking you to help us spread the word for this last push through production. Palm Beach April 17, 18 night shoots EXTRAS and SKILLS needed in Palm Beach! We have two epic night shoots on April 17 and 18 in Palm Beach, Florida and we need your help! This scene will require a massive amount of awesome extras, but we'll make it fun and it least it won't be cold! We are looking for immigrant looking individuals 18-50, who have the patience to run and stand around and be in a movie. (preferably Asian but send us your picture to see if we can make it work) Send your name, age, social media handle, and your availability to casting@snakeheadmovie.com We are also looking for crew members so if you're in the area and interested send us an email at production@snakeheadmovie.com Even if you can't make it please help us out by sharing! San Francisco May 7 sunset/evening shoot We have a shoot in San Francisco and we need extras!!! Tentatively, we plan to shoot on Sunday, May 7th. We are looking for immigrant looking individuals 18-50, who have the patience to stand around and look dirty on the beach. (preferably Asian but send us your picture to see if we can make it work) Send your name, age, social media handle, and your availability to casting@snakeheadmovie.com We are also looking for crew members so if you're in the area and interested send us an email at production@snakeheadmovie.com Even if you can't make it please help us out by sharing! Snakehead is the definition of a low budget independent passion project. Movies can cost a ton of money and when you have to tell the untold stories, sometimes the only way to get it done is to beg, borrow, and ask nicely for people's time, effort, and resources. We don't nearly have the budget of a normal movie, so we have to rely on the community for assistance. While I can't promise anything about the future of this movie, I can promise that this is going to be an awesome experience. We've put together a list of our needs and who to email for it. Please contact us with your info and we'll see if we can collaborate! If you have a specific talent in filmmaking (ie sound, grip, electric, camera, ac, photographer) and want to be a part of Snakehead, please send us your resume. There is no better way to learn how to make a film than to work on a film. We need PA's to help with production, camera, art, AD, etc. Send us an email with your background and we'll find a place for you to work. Crew needs to eat everyday and we're looking for vendors, caterers, and or restaurants in the Chinatown/Lower Manhattan area. Donations, discounts, and/or anything to keep my crew fed and happy. For certain days, we'll need a lot of extras to fill out. Send us your name, picture, and social media handle. We are looking for temporary housing for various crew members for the month of February, let us know if you got a room or apt for rent in the Chinatown or Manhattan area. We are looking to rent a Cube Truck and Passenger van for the month of February. If you have one of these sitting around for the month of February hit us up! 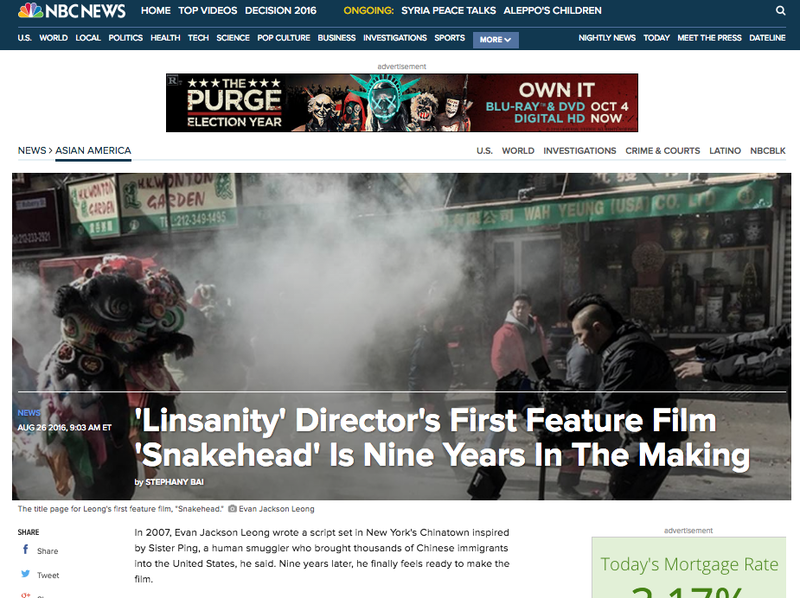 Inspired by true events and based in New York's Chinatown, SNAKEHEAD is an independent feature film exploring the underworld of international human smuggling. we follow the anti-hero, Sister Tse as she rises to one of the most sought after human smugglers in FBI history. From the moment she lands in American waters she quickly learns that the American dream wasn't what she was promised. We will explore the reality of the modern American immigrant through the lens of the Chinatown underworld. Written and directed by Evan Jackson Leong, SNAKEHEAD is a passion project that has been a culmination of over 9 years of research, writing, and development.